I am over the MOON happy with this new Brick Textured Impressions Embossing folder!!! It's so BIG!!! 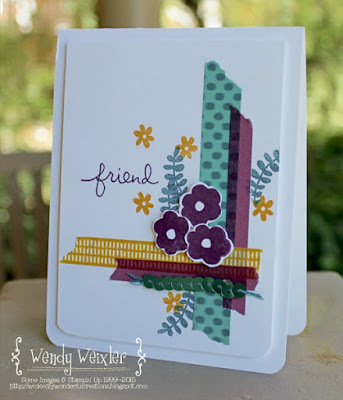 You can turn a standard, A2-sized card in EITHER direction and it will fit JUST FINE!!! Hip-hip-hooray!! SO excited for the upcoming 4th of July holiday ... planning on spending a WONDERFULLY relaxing weekend with family!! I canNOT wait! Click "Back" for Melissa Stout and "Next" for Amy O'Neill ... ALWAYS good things to see from BOTH of this talented ladies!! 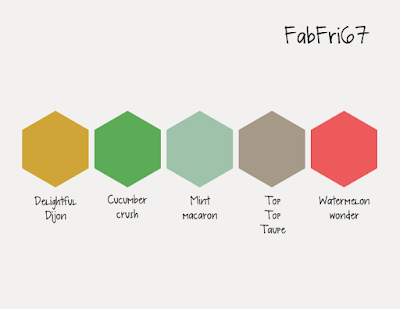 It's Fab Friday and we are all creating this week with the new 2015-2017 In Colors. I only used three of them, but I actually am liking ALL FIVE of them!! I was cleaning my craft room (which seems to be an ongoing thing most of the time!) 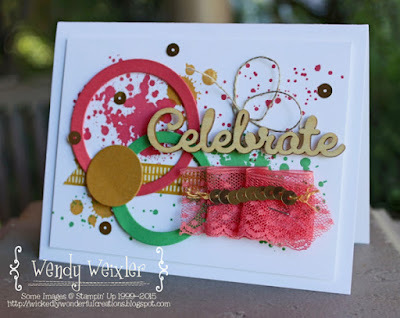 and I came across the bit of ribbon on this card that I stapled together for another card I was making a couple of weeks ago ... couldn't quite get it to work, so I was determined to not let it go to waste!! Have a most happy of weekends!! Something(s) New with the Freaks! Guess what time it is???? Time for the Control Freaks to share some FUN and NEW things from the 2015-2016 Stampin' Up Catalog!!! I'm trying to convince myself that I do NOT need it ALL right NOW!! (And I'm sure this blog tour is NOT going to help me in this area!)! 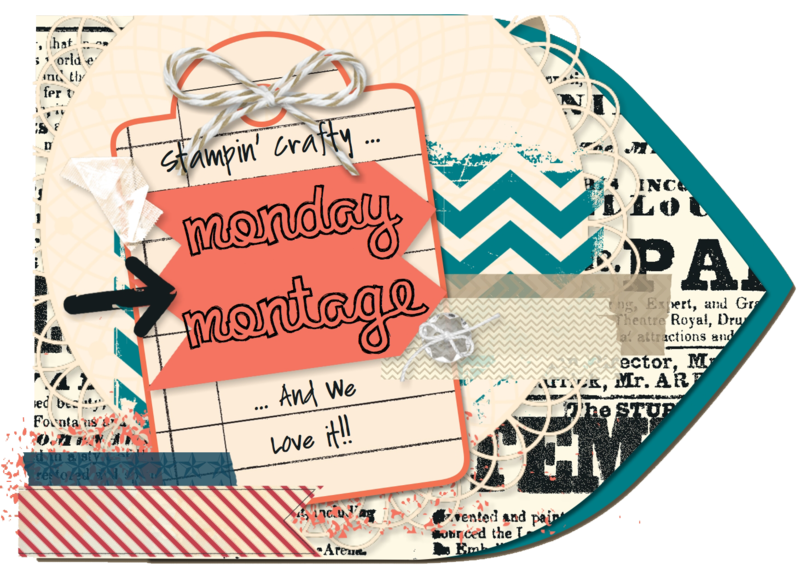 Hopping around, you should've just come from the ever-so-talented Margaret Raburn and her Fun Stampin' blog!! I think I have probably mentioned that I LOVELOVELOVE this new Bohemian Washi Tape. How come I couldn't figure out putting these colors together by myself??? It's not like we HAVEN'T had two of them for a while (and the third one is similar to other things we have/have had!). 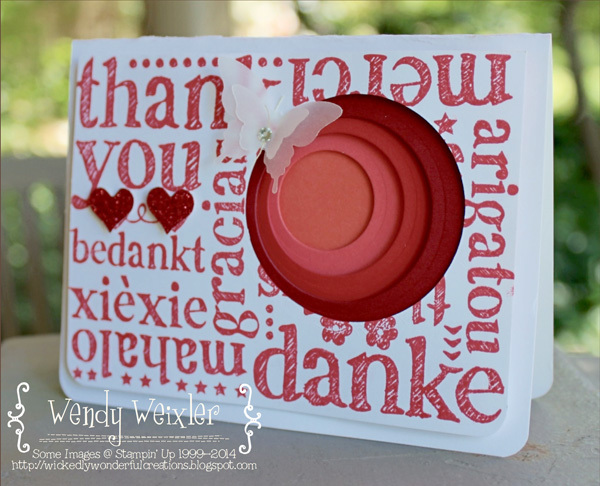 This little stamp set (Endless Thanks) is SO very versatile, too! It will be seeing a LOT of ink, that's for sure!! I kinda have a theme today ... white-on-white with rounded corners at the bottom!! What a GREAT background stamp!! I have been wanting to try this "inverted circle" sort of technique for a LONG time! FINALLY made myself give it a try! Next up?? The "Flower Bug" herself LeeAnn Greff! She has been inspiring me for YEARS!!! I have a very difficult time with "flat" cards. Don't get me wrong ... 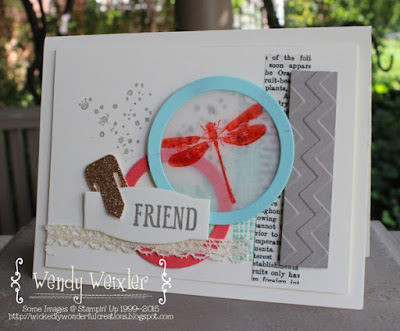 I am ASTOUNDED and AMAZED at people who can make beautiful "flat" cards ... I just canNOT do it!! I am ALWAYS having to "pop" stuff up ... it just looks WRONG when I leave things "flat" ... sigh ... I really admire people who can do it ... and make it look EASY! Had a VERY eventful weekend ... but the thing I am MOST proud of was completing my FOURTH half marathon last Saturday (it's actually the same one I did a year ago as my first!)! The BEST thing is that I really feel like a runner (FINALLY!)! Last year, I was HIGHLY underprepared and the thing nearly KILLED me!! This year I felt "in the zone!" I'm not gonna lie ... my muscles be SORE ... but it's a GOOD kinda pain. Know what I mean?? Click "Back" for Melissa Stout and "Next" for Amy O'Neill ... so much good to see!! SQUEEEEEEE!!!! (That's the sound ya make when you have NEW stampy goodness in the house!!) I wish I had MORE time to play (I'm working on some decorations for a friend's wedding that is NEXT week!) 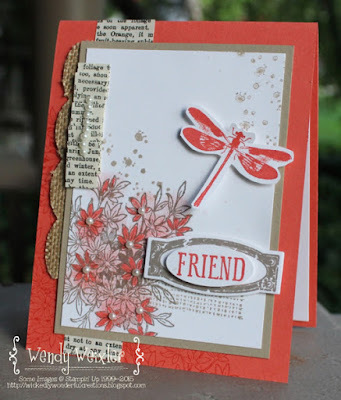 ... but I DID squeeze a little time to play with this week's Fab Friday Stampin' Challenge. 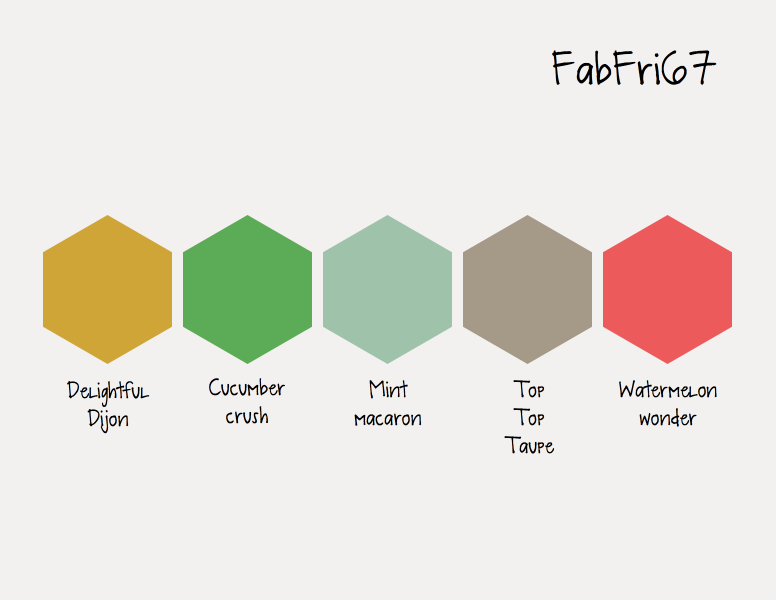 I LOVE having a place to "start" when someone gives me a sketch or a color scheme ... this week's sketch is SO much fun!!! I just had a hard time NOT adding more and more stuff!!! Sometimes I don't know where to stop!!! Hoping to survive the weekend!! Not the LEAST of which is my FOURTH 1/2 marathon ... this is the SAME one I did last year as my "first" ... the scenery is going to be BEAUTIFUL!! Yep ... I'm here ... I'm still ALIVE!!! I have had the craziest-busiest couple of weeks!! Sheesh!! Run-run-run ... go-here, go-there, go-everywhere!!! Seems like the hurried-er I go, the behind-er I get!!! This is gonna be the QUICKEST of blog posts, too!!! I've had this card done for about TWO weeks ... and haven't even had the time to post it!!! 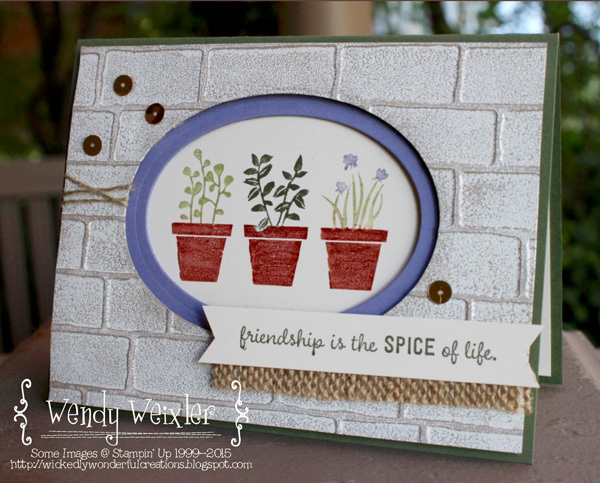 It's quite similar to one I did last month (same basic layout, similar colors) ... but I changed up the stamp set. 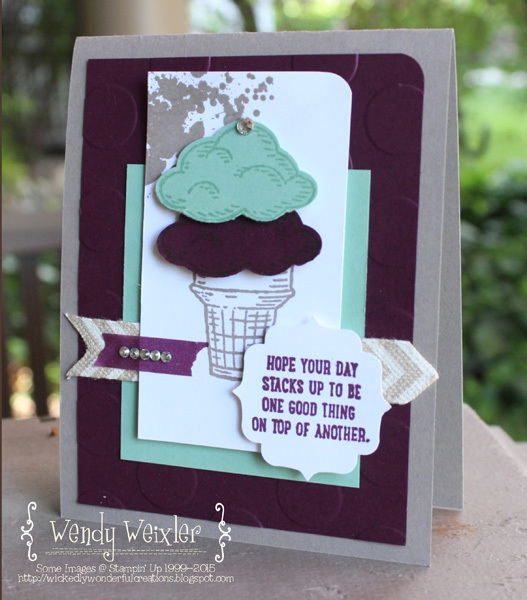 And since it is getting VERY hot here, ice cream is DEFINITELY in order!! Tune in tomorrow for some Fab Friday FUN!!! (Two posts in two days??? What on EARTH is going ON?? ?